Even if you like to pretend you’re a health food addict, chances are you secretly love fries, cake, and sugary foods. Or maybe you don’t care who knows of your love of fried goodies, but you don’t want to have to go out to get it. Or when you do go out, anyplace you go to doesn’t do very well at making your favorite goodies. You have probably tried oil in your frying pan to make your own fries. It’s messy and complicated and takes a long time too. It can sometimes be a little painful with hot oil splashing back on you as you are making your delicious, homemade fries. Truly the best fries are the homemade style, because you can make them exactly as you like them. With an overall awesome customer review on Amazon, the Rosewill Air Fryer is a fantastic air fryer. 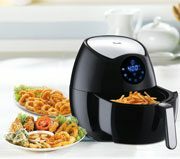 One of the best AirFryer with unique features. This handy fryer does all of the work for you! So not only will you get delicious fried food in just minutes, you don’t even have to work hard for it. Or, better yet, you don’t even have to leave your home. This little machine has presets for cake, fries, steak, shrimp, meat, fish, chips, and chicken. An added bonus is that you need hardly any oil at all, meaning easier clean up at the end of all your delicious frying and baking. So maybe you’re a little more savvy than the average fry guy and know just how long your food needs to fry. The Rosewill Air Fryer has a customizable timer which allows you to adjust the time up to thirty minutes! And you can adjust the temperature to your personal preference. So just like any other handy appliance you have in your kitchen, just set the timer, and go enjoy your favorite television show, or the latest issue of Scientific American. This particular fryer is incredible. Not only do you need barely any oil if you decide to fry something, it does more than just fry food. It can also bake, grill, and roast! With a 3.3 quart capacity, it can make a lot more than you might think. For a size reference, your average 13×9 cake pan holds 3 quarts of food (or cake batter!) Think of how quickly and easily you can make cakes now. The Rosewill can also grill your foods too! So toss in a steak and enjoy! The Rosewill Air Fryer weighs only 11 pounds. This means that shipping is relatively cheap, no matter where you order from. This also means you won’t need to be a bodybuilder in order to move it every time you want to wash your counters. This also means that it’s easy to move if you just want to keep it put away when you aren’t using it. So, despite being over a foot wide, it still weighs less than that 5-gallon water tank you had to change at work today. If you aren’t convinced this fryer is great, just think about clean up. When is the last time you made your dinner or dessert at home? Clean up was probably a pain to deal with. And who, apart from Cinderella, really enjoys cleaning up? The clean up on this is a breeze. Just detach the fry basket, separate the parts, maybe give them a quick rinse to get rid of the big stuff, and then just drop into your dishwasher. Ta-daa! This has the easiest cleanup of any fryer that you will ever find. ✅ Quick cleanup- the fry basket easily detaches for speedy cleanup. This means you can get done with cleaning and back to your life faster. ✅ Multi-functional- this fryer also grills, bakes, and roasts! This means one little machine can make your steaks, fries, and your cake for dessert. ✅ Easy to use- with seven pre-programmed functions, just load your food, hit the correct setting and go! ✖ Flip your food- during the cooking/frying process, you may have to flip your food to ensure an even bake. ✖ Takes up space- while it’s lightweight, the Rosewill Fryer takes up about 14×13 inches of counter space. ✖ Learning curve- at least one review said their fryer didn’t come with a manual. This seemed to be just one review out of many. Most reviewers seemed to feel the fryer was fairly straightforward. Q. How durable is this product? Q. Does it really fry without oil? Q. Is it dishwasher safe? ➡ Yes, this fryer is dishwasher safe! The basket easily slides out for quick cleanup. The frying basket and tray slide out and separate for easy washing. 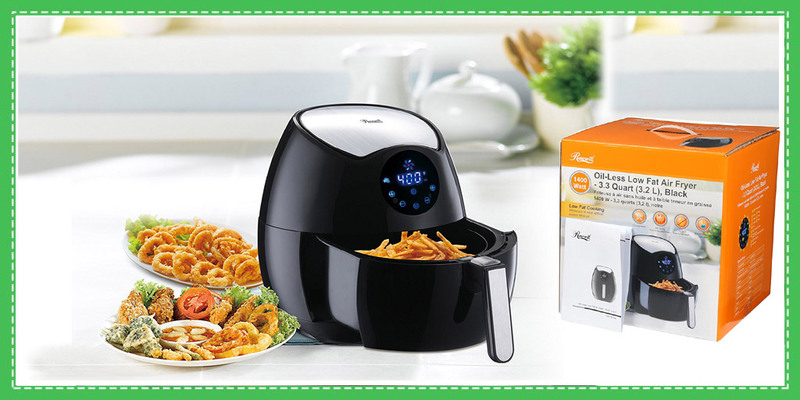 If you are searching for a way to have fried foods, but still remain healthy, this fryer is perfect. With its virtually oil-free ability to fry your foods, it cuts back on your grease consumption. This makes it a healthy option to use. It is also lightweight, making it easy to move out of your way. The cleanup is also infinitely more easy than dealing with oil and grease from a frying pan. If you are ready to move past the difficulties of traditional cooking, frying, and baking, then the Rosewill Air Fryer is perfect for you.